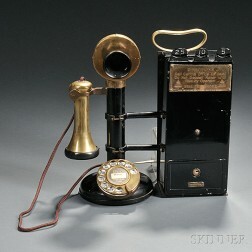 Save your search - find out immediately when "Candlestick telephone" is available at auction! Bell System Enameled-metal Telephone Sign and Northern Electric Co. Nickel Silver Candlestick Telephone. Western Electric Brass Candlestick Telephone. Vintage Candlestick Telephone, a Western Electric Telephone and Headset. Candlestick Telephone By American Bell Telephone Co.